Sign up to receive Dr. Roger Allen’s email newsletter and receive a free copy of his eBook, “Master Your Self-Defeating Emotions”. 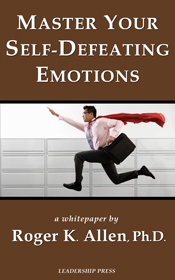 A free PDF version of the ebook, How to Master Your Self-Defeating Emotions (once you confirm your subscription). A free email newsletter featuring great new articles on trending personal development topics written by Dr. Roger K. Allen, author, consultant, and personal/executive coach. Special offers and promotions on Dr. Allen’s current and upcoming personal development products like books, ebooks, workbooks, audio programs, and workshops. A promise that your email address will not be shared with any other sites and that you can unsubscribe from the mailing list at any time. Enter your email address down below, click subscribe, then click on the link that comes in the email confirmation. You will receive another email containing the link to your free ebook. Stay connected with Roger K. Allen and follow him through his social media outlets.